There a bright prospect lying ahead for the Pingtan, a dynamic economic pilot area in Fujian province, according to Lin Join-sane, chairman of the Straits Exchange Foundation (SEF). Lin made the remark during a meeting with Li Dejin, Secretary of the Pingtan Party Committee, in Taipei on July 29. Li was leading a delegation to Taiwan to promote Pingtan’s business climate. Lin welcomed Li, who he called an “old friend”. 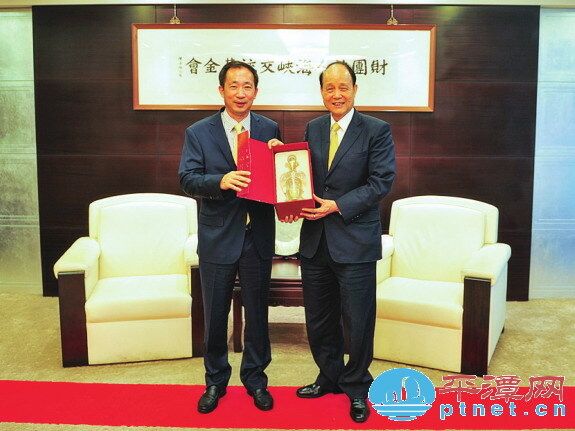 The two first contacted in 2013, when Lin wrote a congratulation letter to Pingtan’s authorities on the establishment of an investment association by Taiwan businessmen in Pingtan. In April, 2014, they met for the first time in Taipei. Lin praised Pingtan’s outstanding achievement over the last few years and said it created vast business opportunities for Taiwan people. Pingtan was designated by mainland authorities in 2009 to carry out reforms and boost cross-Straits cooperation. It was included as part of the Fujian Pilot Free Trade Zone in April this year, with hopes that it can further deepen cooperation with Taiwan. Pingtan has made a number of preferential policies for Taiwan investors and businessmen, said Lin, who pledged to promote them in Taiwan. SEF plays an irreplaceable role in cross-Straits communication, said Li, who added that Pingtan is looking forward to more investment from Taiwan in logistics, Internet economy, cultural creativity and scientific research and development.